Note: If you’re reading this in Internet Explorer, please switch to Firefox or Chrome now. Copying and pasting the example programs from Internet Explorer will not work correctly. 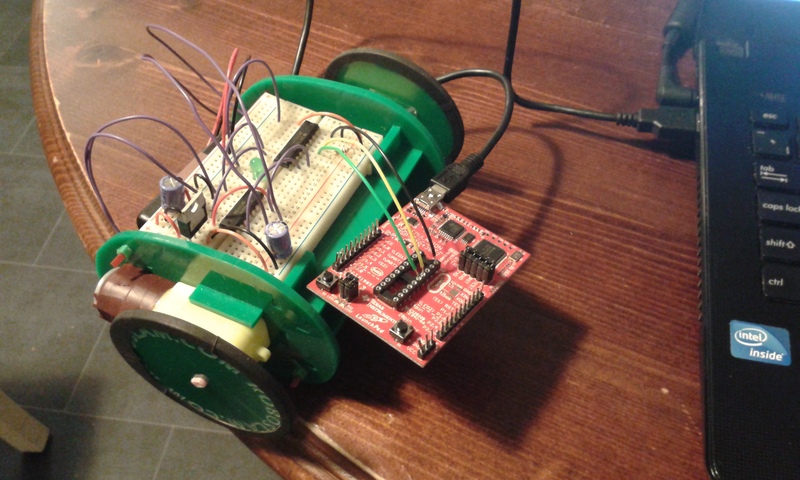 We have pre-programmed your MSP430 microcontroller with a simple example program, so once you insert batteries into your completed robot it should spring into life. This stage of the workshop is where you really begin to take control of the robot. We will work through three example programs, each of which illustrates how to control a different feature of the robot. To write programs that control your robot, you need a text editor called Notepad++ and a C compiler called mspgcc. Check if there is a folder called “C:\RoboSlam” on your PC. If it’s there, it probably already contains all the software you need to program your robot so you can skip to Step 2.2. In case the folder “C:\RoboSlam” isn’t already on your PC, we have created a zip file called "roboslam.zip" which contains all the software you need. If you don’t have the “C:\RoboSlam” folder, please download “roboslam.zip” and extract its contents to "C:\RoboSlam\". To update the software on the robot, you need to connect it to the PC using the MSP430 Launchpad. The Launchpad connects to the PC via a USB socket. It connects to the robot via three colour wires that you’ll find in your kit – black, green and yellow. The black wire connects GND on the Launchpad to hole H3 on the breadboard. The yellow wire connects TEST on the Launchpad to hole H6 on the breadboard. The green wire connects RST (short for “reset”) on the Launchpad to hole H7 on the breadboard. The three programming wires are shown from various angles in the photos below. To make the programming wires clearly visible in the photos, the colour sensor module was temporarily disconnected from the breadboard. However, you should leave yours connected. It’s time to compile your first program to control your robot. Open the Notepad++ text editor by double clicking on the "Run Notepad++" shortcut in the RoboSlam folder. Copy and paste the file "build_for_g2452.bat" from the "RoboSlam" folder into the "blink" folder. Before switching on the power on your robot, make sure it won’t drive off the table! Switch on the power on the battery pack. 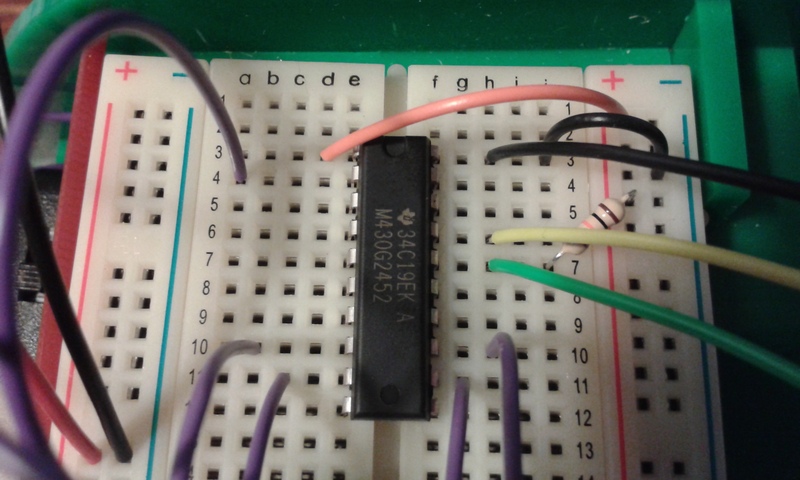 Double click the file "build_for_g2452.bat" to compile the blinking LED example and copy it onto the microcontroller, where it should start running immediately, causing the LED to blink on and off! 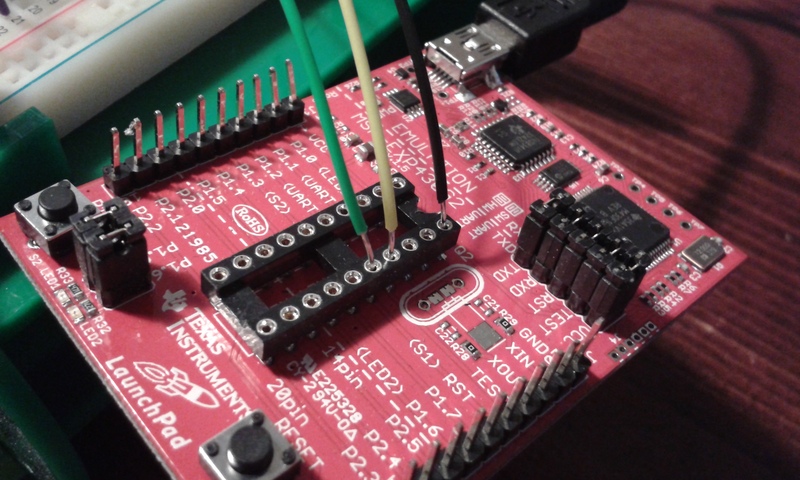 Two pins – pin 1 (VCC) and pin 20 (GND) – are used to supply the MSP430 with power. Two pins – pin 16 (RESET) and pin 17 (TEST) – are used for programming. The remaining 16 pins are divided into “ports”, each with 8 pins. The following diagram shows which pins on the MSP430 are in each port. Copy and paste the file "build_for_g2452.bat" from the "RoboSlam" folder into the "zigzag" folder. Double click the file "build_for_g2452.bat" to compile the zigzag example program and copy it onto the microcontroller where it should immediately start running, causing the motors to move. // This function controls the motors. // For each motor, 1=forward, 0=stop and -1=reverse. // motors( 1, 1) goes forward. // motors(-1, 1) spins left. // motors( 1,-1) spins right. // This function controls the LED. // led(1) switches the LED on. // led(0) switches the LED off. // This function reads the colour sensor input. // The output value is 1 for white and 0 for black. Challenge: Modify the zigzag program to make the robot drive in a square pattern. Place an object in the centre of your table and see how many times you can make your robot drive around it without either touching the object or falling off the table. Create another new folder called "C:\RoboSlam\sensor\". Copy and paste the code below into a new file in Notepad++ and save it as filename "main.c" in the "sensor" folder. Copy and paste the file "build_for_g2452.bat" from the "RoboSlam" folder into the "sensor" folder. 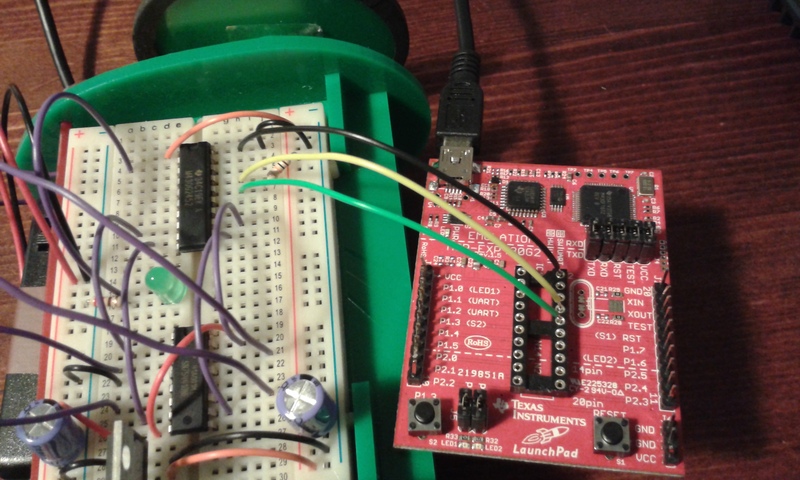 Double click the file "build_for_g2452.bat" to compile the colour sensor example program and copy it onto the microcontroller, where it should immediately start running, causing the motors to move. Disconnect the robot from the LaunchPad. It should drive forward on a black or dark coloured surface but turn on the spot when the sensor detects white or another light colour. Challenge: Can you make your robot turn through 180 degrees every time its sensor detects white?